Let's take a break from statistics and do some physics! My friend Ted Bunn recently wrote about the falling slinky problem in his blog. He points to this video, which shows a falling slinky in slow motion. After the top of the slinky is released, the bottom seems to hover until the top reaches it. The effect is particularly strange because if you look carefully, the top of the slinky does not accelerate as we expect for an object in free fall. Rather, it falls at a constant rate. ...the information that the top end has been dropped can’t propagate down the slinky any faster than the speed of sound in the slinky (i.e., the speed at which waves propagate down it), so there’s a delay before the bottom end “knows” it’s been dropped. But it’s surprising (at least to me) to see how long the delay is. This explains why there is a delay, but to me it doesn't explain why the delay is the same as the time it takes for the top of the slinky to reach the bottom. There are lots of models out there that explain parts of this behavior, but the ones I found are either complicated or wrong. Here's my take on it. First, let's assume that what we see in the video is correct: the slinky collapses from top to bottom, so that each coil doesn't move until the one above it comes down and (nearly) hits it. So the speed of the top of the slinky is sqrt(gL). We can get to the same result a different way by using the formula for wave speed in a vibrating string: sqrt(T/μ), where T is tension and μ is mass per linear measure. In this case T=mg and μ=m/L. Plug that in and get wave speed sqrt(gL). I think this analysis is useful, but to be rigorous, I haven't really explained why the slinky behaves the way it does. I have only shown that if the slinky collapses from top to bottom (as it appears to), then the top moves at a constant speed (as it appears to). 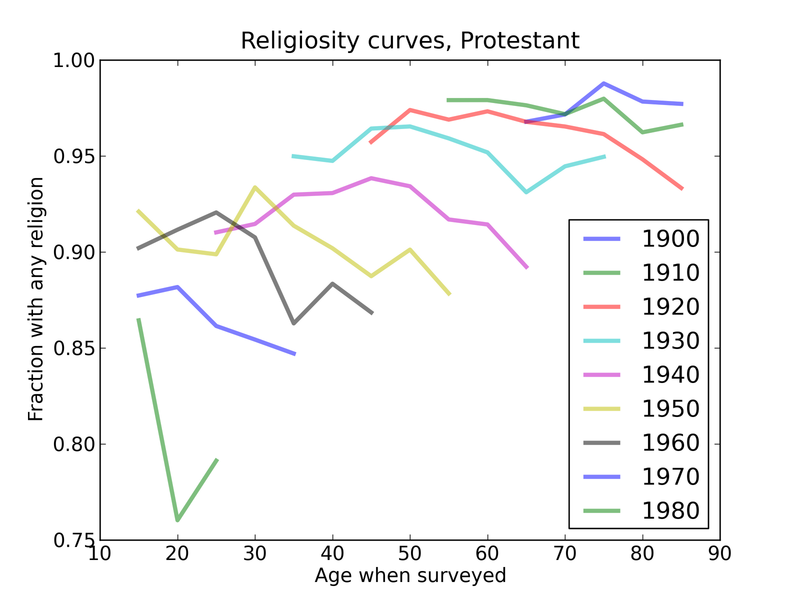 In Part One I described some trends in market share of the major religions in the U.S.; in particular, since 1988, the fraction of Protestants dropped from 60% to 51%, and the fraction of people with no religious affiliation increased from 8% to 18%. Each child chooses a religion. 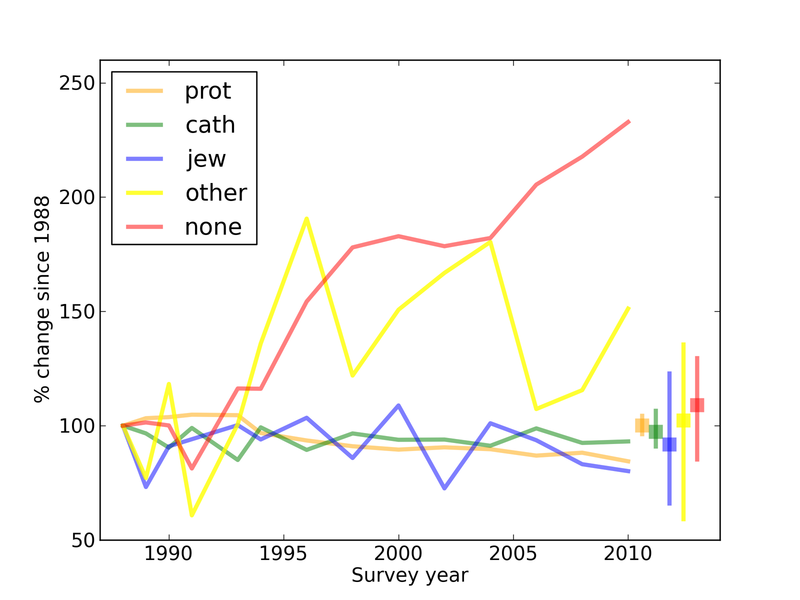 I model each step of this process using data from the General Social Survey (GSS); specifically, I used these variables. 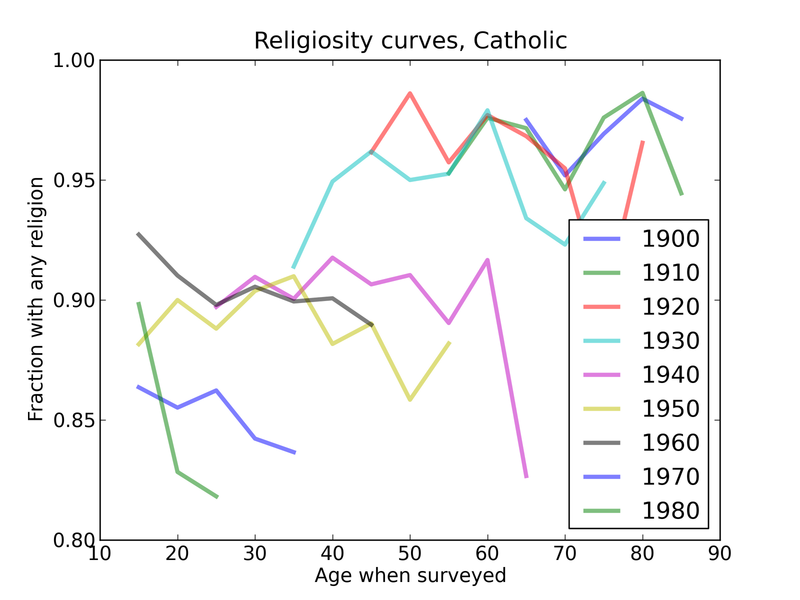 RELIG16: In what religion were you raised? MARELIG: What was your mother's religious preference when you were growing up? PARELIG: What was your fathers's religious preference when you were growing up? 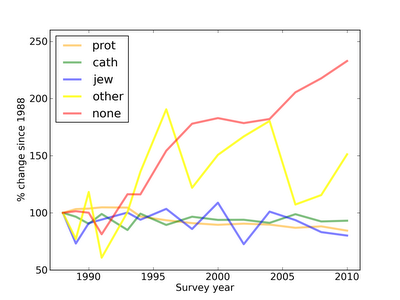 The first two questions were asked every year, but questions about parents' religion were only asked in 1988 and 2008. I will use the data from 1988 to build and validate models, then use the data from 2008 to make predictions. 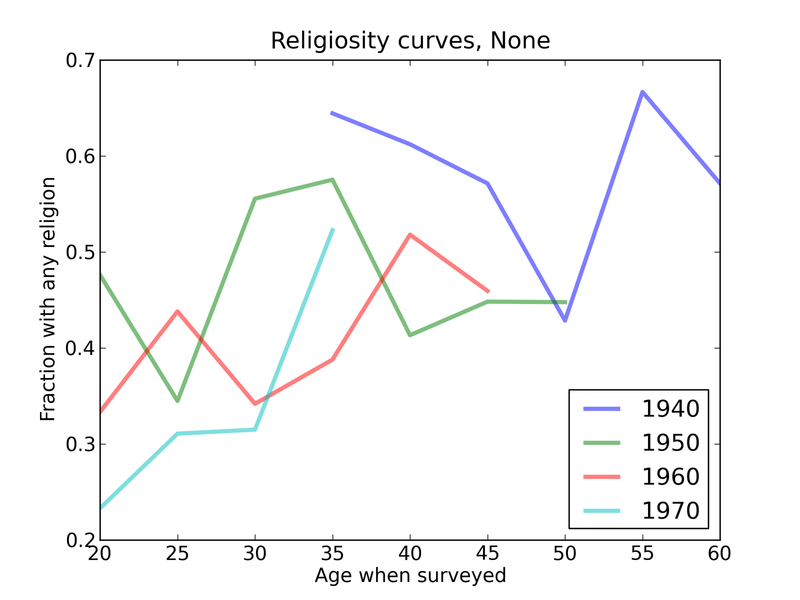 Each row indicates the religion of a male respondent; each column is the religion of a possible spouse; the numbers are percents. 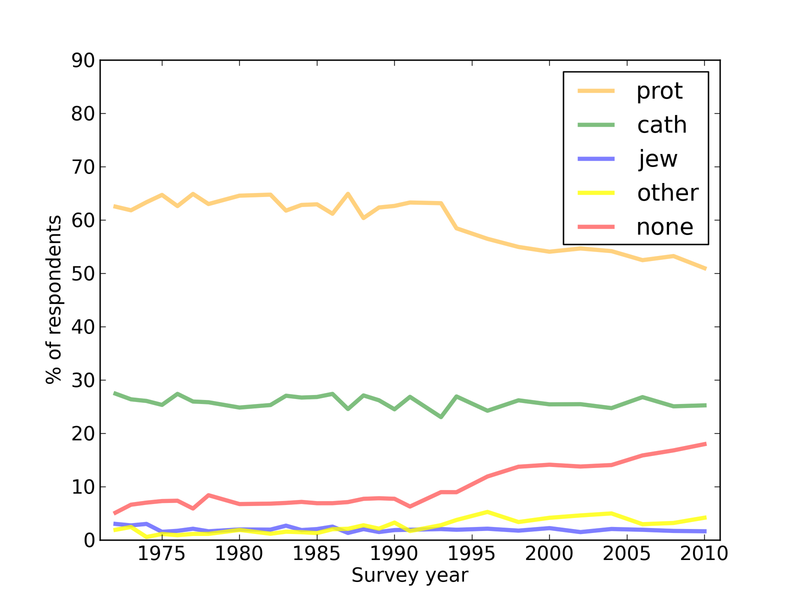 For example, the first row indicates that 93% of male Protestants married other Protestants, and another 6% married Catholics. In general, women are more likely to marry out of their religion than men, but still the great majority marry a co-religionist. One asymmetry is apparent: men with no religion seldom marry another None (24%), but women with no religion usually do (80%). This effect is partly due to the gender gap: 11% of male respondents are Nones, but only 5% of the women are (there is a similar, possibly smaller, gender gap in the CIRP data). Once the respondents have paired up, they decide what religion to raise the children in. 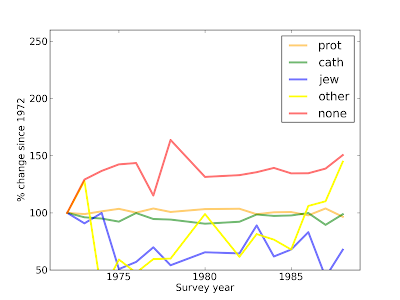 The following table shows results from the 1988 data. The rows enumerate all pairs of mother's and father's religion; the columns indicate the religious environment they chose. 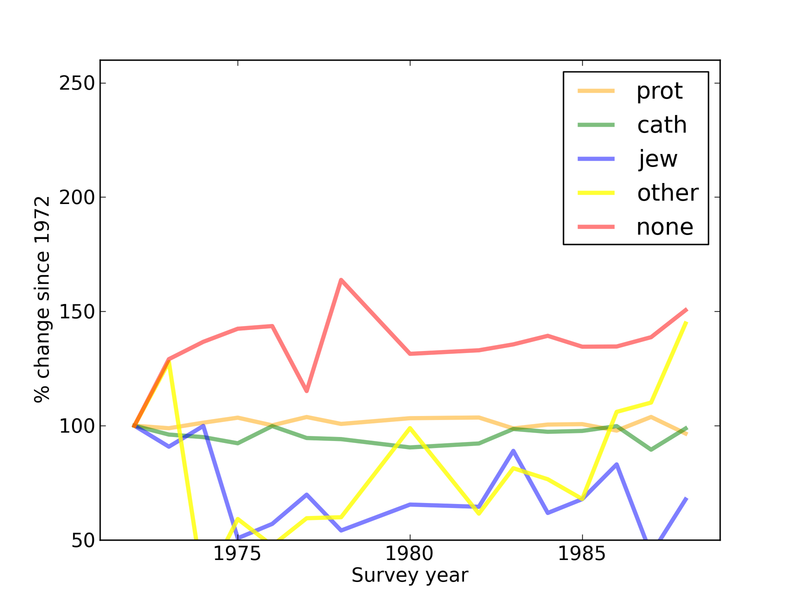 For example, the second row indicates that if a Protestant woman marries a Catholic man, they raise the children Protestant 58% of the time, Catholic 36% of the time, and None 6%. One surprise in this table is the last row: when two people with no religion marry, 40% of the time they apparently choose to raise their children Protestant. This seems unlikely, but there are several possible explanations: (1) the parents might have chosen to raise their children in the prevalent religion of their community, (2) a respondent might not have been raised by his parents, (3) a respondent might not be reporting his parents' religion accurately. For purposes of modeling I take these responses at face value. 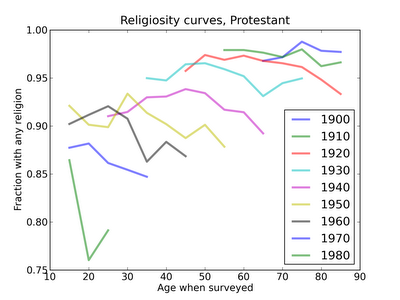 Children raised with a religion usually adopt that religion, but not always. 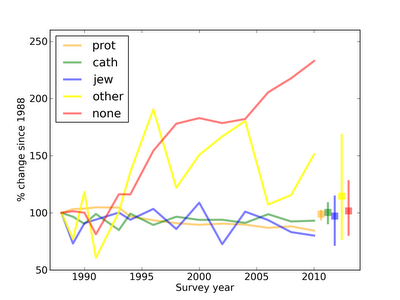 The following "transition table" shows possible outcomes for each religious environment. For example, 89% of respondents who say they were raised Protestant also report that their religious preference is Protestant, but 3% are Catholic and 6% have no religious preference. 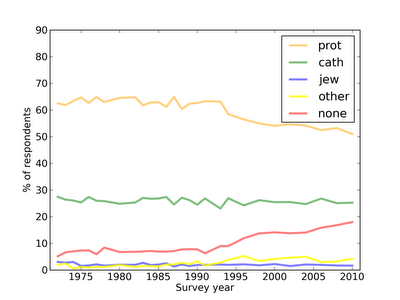 More people convert from Catholic to Protestant than the other way around. As expected, the majority of people raised with no religion report no religious preference, but 32% of them identify as Protestant and 11% identify as Catholic. I found that surprising. I will look more closely later, but for now, again, I will take it at face value. 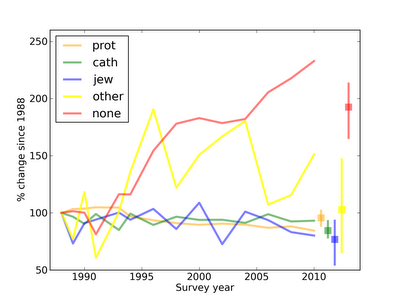 Finally, we can combine these results into a single "Generation table" that shows the transitions from one generation to the next. I ran simulations with following steps. 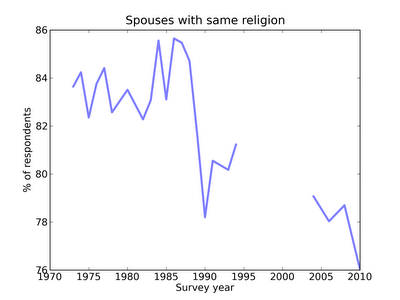 For each respondent, choose a spouse's religion from the Spouse Table. For each parent pair, choose a religious environment from the Environment Table. For each hypothetical child, choose a religious identity from the Transition Table. For each parent-child pair, make an entry in the Generation Table, below. The actual values for Catholics, Jews and Other fall within the prediction intervals, but the model fails to predict the decrease in Protestants or the increase in None. So, what's missing from this model that could account for the observed changes? 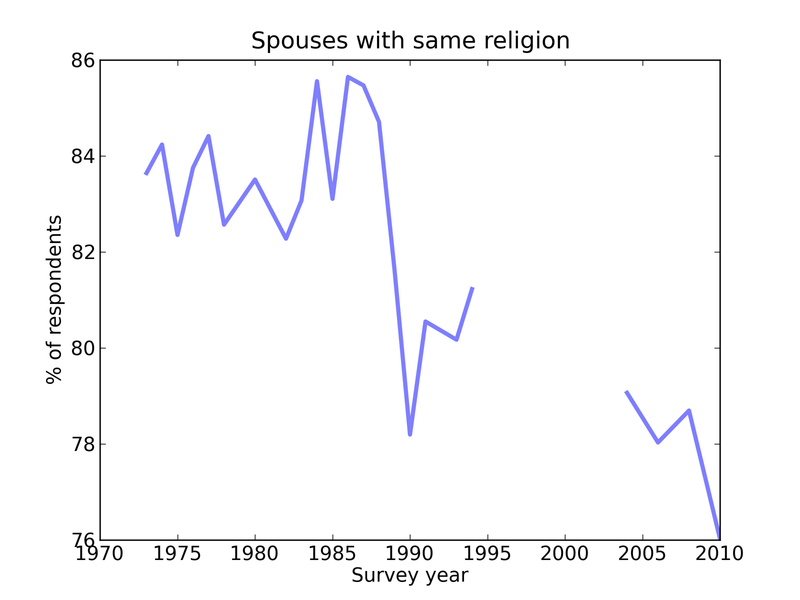 The spouse tables are based on the parents of 1988 respondents. 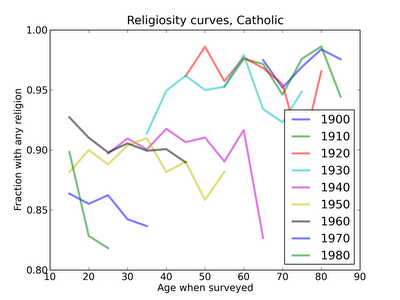 People from later generations are increasingly likely to marry outside their religion. 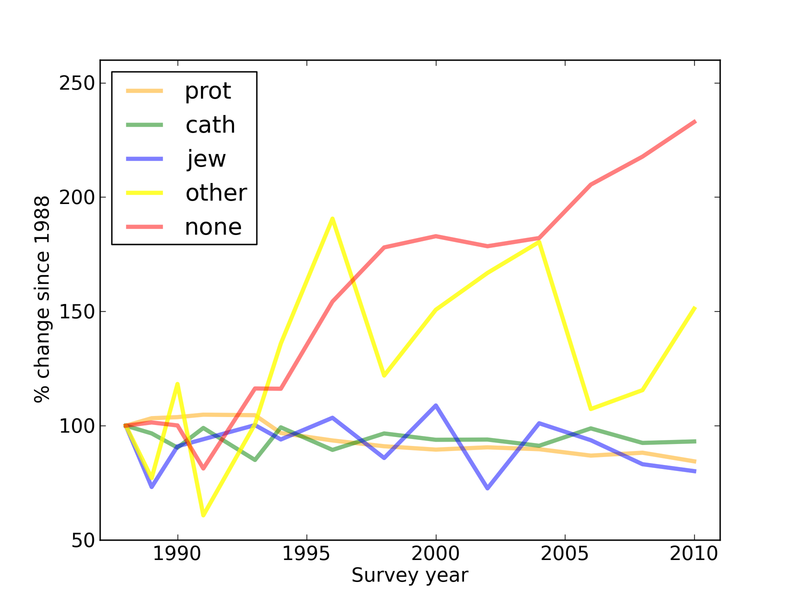 The transition table is based on 1988 respondents; it's possible that after 1988, children were less likely to adopt the religion they were raised in. Anecdotally, the culprits most often blamed for this effect are college and the Internet. Over the next few installments, I will investigate each of these factors to see which, if any, account for the observed changes.